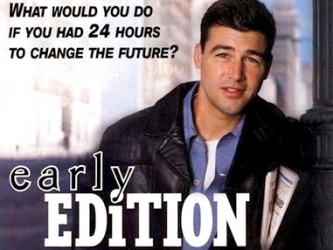 Tags: Early Edition, Ethical Dilemmas, Morals, Tomorrow's news today, What would you do? Gary Hobson is the man with the cat he didn’t want, and the paper that is a curse or a blessing depending on your point of view. He is a man in a midst of a transition having quit his job as a trader, and his wife having divorced him (to marry his boss no less). He has his angel and devil caricatures, Marissa, his angel who gets him to think of the altruistic ways to use the paper, and Chuck, who seeks out what is needed for personal gain. But what is this paper? It is tomorrow’s news today. Things have a way of working out in this life. One way or another, you usually get what you need. Those who need to be remembered, they get a moment; those who need to be heard, they get a voice. There’s no way of knowing how it’s all going to fall into place mind you, but trust me, it does. Justice may be blind, but that doesn’t mean there’s no one looking out for you. Hobson, after the philosophical-ethical dilemma after Hobson’s Choice, where you are given a bit of information to choose to make a little-big difference or remain safe. That is the premise of each episode, from Presidential Assassinations to medical neglect on Children to jury duty. The list goes on, but eventually there is a meow and a thump at the door for the mysterious sun-times paper for the next day appears, and he has 24 hours to change a headline. They say things happen for a reason, but that reason may not always be clear. In time, with faith, the meaning may emerge. What was, what is, what shall be. Pieces of a puzzle, falling into place. A fun show from 1996-2000 that made one ponder and think what you would do. And in the course of the adventures it is seen that even, begrudgingly, Chuck helps. So what is your Hobson choice in life, it may not be tomorrow’s news today, but each and every day we are given information to make choices. Do we make choices that make the most good for us and our neighbour, or only for our own bank account? [voice over] It’s easy to be cynical. Especially today, when it looks like all our heroes are crooks, our role models frauds. Every now and again, however, when you least expect it, the real thing comes along: someone who can find the heart inside the cynic and give those who hold nothing sacred something to believe in. It’s not always easy telling the good from the bad, even if you do get tomorrow’s paper today. Why, is why. Sometimes, to find the answers, you have to look in your heart. Cynicism is the easy choice. It can take more to look deeper, ask harder questions, and seek out what is right.